The Young Entertainer Awards recognize outstanding achievement in TV, film, theatre and music from youth in the industry. 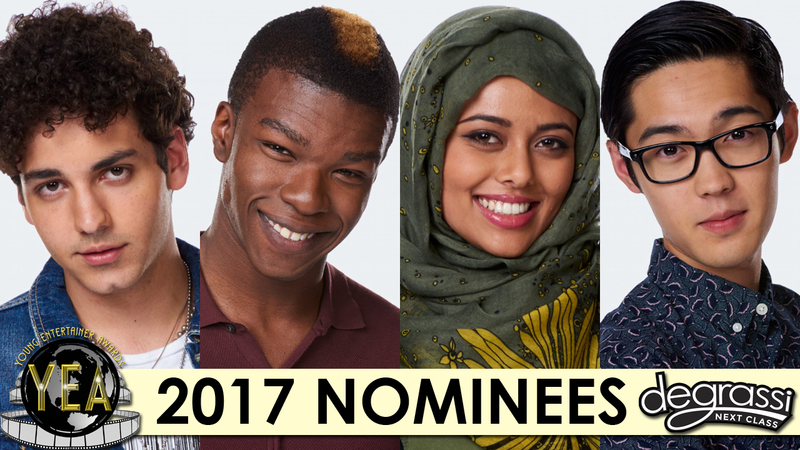 Last year Degrassi received two nominations, but now they have four total in 2017! Ehren Kassam, Richard Walters and Andre Kim have all been nominated for Best Leading Young Actor in a TV series, while Soma Bhatia was nominated for Best Leading Young Actress in a TV series. Soma was also nominated for a second award in another category: Best Supporting Actress in a TV Movie, Mini Series or Special for her role in the movie Holiday Joy. Congrats to everyone for their nominations! The awards ceremony will be on Sunday, March 19th at Universal Studios in Hollywood. You can find more info on the Young Entertainer Awards here. Andre was barely in this season, though? I would assume it’s for his story arc with Golja in Season 2 of Degrassi: Next Class, but who knows! I agree though!